Now that blogs have been around long enough to practically qualify as old media, the people who write and maintain them often find themselves juggling professional and personal blog duties. While the process of writing and publishing a blog post is ostensibly simplicity itself—load the blog's entry form in your browser, type away, hit Submit—if you're hitting several different sites a day, the process gets a little tedious. 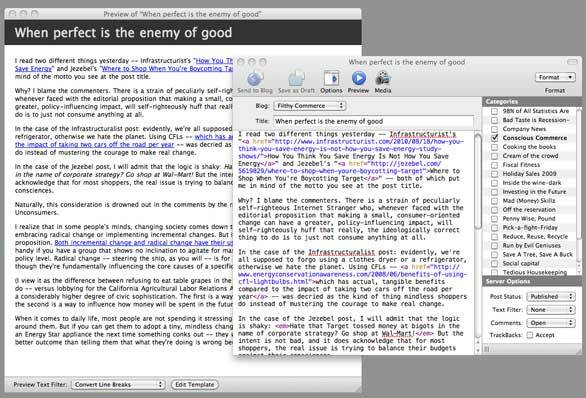 MarsEdit 3.1 simplifies the workload for any blogger, but it's best for people who are busy with more than one blog. It's a desktop-based application that lets you enter the configurations for multiple blogs, then write, edit, format and publish your posts. The biggest selling point for the new version: an improved WYSIWYG interface for post composition. You now have the option to compose posts in either Rich Text or HTML format, and as you type, a separate preview pane pops up and lets you see how your post is going to look. It would be nice if you could edit in the preview pane—for example, in one test post, a subject-verb disagreement eluded me in the composition window but popped into plain relief in the preview window, and it would have been easier to correct it the minute I saw it—but this feature is not a vital must-have. 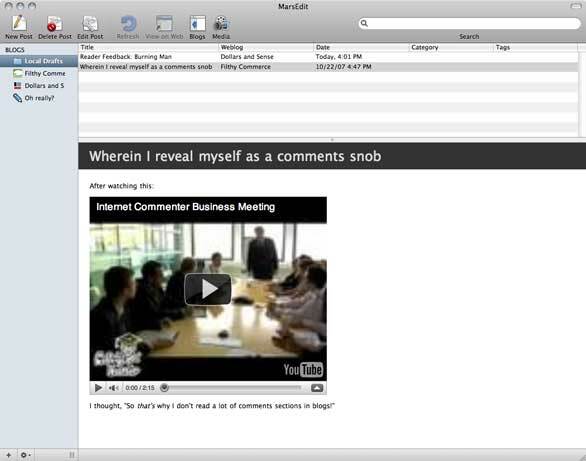 Another welcome new feature within MarsEdit is the ability to schedule your blog posts' publication. Using the Edit Date option under the Posts menu, you can type the date and time you want a specific post to go live. This is a handy feature for people who are responsible for producing multiple blog posts per day or for people who are queuing up posts for pre-planned vacations and time off. And there's new integration with iPhoto ( ), Aperture ( ), Lightroom ( ), and Flickr, letting you upload photos from your libraries with a single click. As you produce your post in one window, you can check to see how it's formatted in the preview pane that pops up nearby. Composing and publishing posts is the easy part. Users may be slightly more challenged by how to configure their individual blogs—and that difficulty could offset MarsEdit's ease of use in blog production. This is an unfortunate step back from prior versions. One of the blogs I tested MarsEdit on is hosted on Typepad's service. Configuring the application for this blog was easy—all I had to do was enter the blog's name (it will be displayed as an option in MarsEdit's main window pane) and the homepage URL, then click the Auto-Detect Settings From URL button, and a few seconds later, I was in business. MarsEdit's built-in help didn't provide any documentation on what an API Endpoint URL or an RPC URL is. I had to resort to doing a quick Google search of Red Sweater's support forums, where I found a five-year-old post telling me that the API Endpoint URL is the same thing as an RPC URL—and maybe the error message would one day reflect that. According to Red Sweater, the problem was that the home page for the blog I was trying to post to lacked special identifiers that could provide information about how to connect to the blog from a remote client. If I wanted to update the privately hosted blog via MarsEdit, I'd have to manually configure the settings so they point right to the endpoint URL for a blog. This would require seeking help from the server systems administrator—not necessarily a hardship, but an extra step I'd have to take to use MarsEdit to the fullest. I also tested MarsEdit on an old LiveJournal account, and had no problems immediately loading all the configurations I needed. So, the good news about MarsEdit 3.1 is that if you're using any one of a number of hosted services—Typepad ( ), LiveJournal, Tumblr ( ), Vox, Blogger—you can get up and running in no time. If you're the one actually running the server upon which your WordPress or Drupal-configured blog is living, you'll be able to fill out all the relevant RPC URLs. But if you're a contractor who has guest access on someone else's system, you may have to jump through more than a few hoops to configure your blog on MarsEdit. The inconvenience may not be worth the time you'll save having one place to produce your many blog posts. MarsEdit's main application window shows you which blogs you've got set up and lets you visually preview the posts you've already worked on. However, you cannot edit any post you view in preview mode. Bloggers who value efficiency will appreciate MarsEdit 3.1's ability to write, preview, save, schedule, and publish entries from within one application, rather than having to jump from one Web-based entry page to another. For people maintaining multiple blogs, MarsEdit can be a very powerful tool for simplifying your workload—if you can get all the blogs configured correctly.